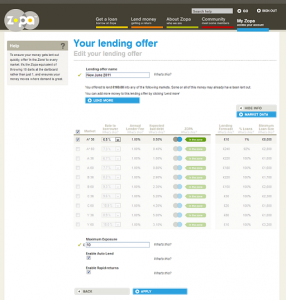 Creating a Lending Offer is one of the key actions a Lender at Zopa can take. To make the experience simpler for new Lenders and at the same time give enough information to more experienced Lenders, we have launched a new simplified Lending Offer screen today. This blog post explains the changes we have made to the screens and above all, the data they present to our Lenders. Zopa icon The data that informs the Zopa icon has been changed slightly to be more representative of what’s actually going on in the markets. While previously, the Zopa looked at the last 5 matched applications and defined the lower and upper boundaries as the lowest and highest rates included in these loans (which meant the Zopa could fluctuate quite rapidly), the new Zopa boundaries are defined by the extremes of the last 7 days. The upper boundary comes into force when the rate you’ve selected was not included in any of the loans approved in the market during the last week, while the lower boundary is defined by the rate that would’ve gotten you included in absolutely every loan approved in the past week in the respective market. More information section One of the key improvements in the new screen is the quality of data we provide that further informs how you set rates – in addition to the Zopa icon. Instead of the ‘Max rate’, ‘Min rate’, ‘Lending Speed’ and ‘Offered Lower’ columns, you can now see a ‘Lending Forecast’, ‘% Loans’ and ‘Minimum loan size’, based on the data of the last 7 days. These columns are intended to show more experienced (or interested newbie!) Lenders what they could have lent and how many % of loans they would have been included in the past 7 days and at what loan size their money would currently be matched at using the selected rate. While we can’t issue 100% accurate predictions, the performance in the previous week should be a good indicator of the possible performance in the future. Market data You may have heard of our weekly market data spreadsheet in the weekly Lender email, you may have even downloaded it before. If you have, you might also know that it’s updated once a week on a Monday, and therefore not very useful on a Friday afternoon when you want to find out where you are in the Queue. On the upside, it’s in a spreadsheet format, so you can easily find yourself and do calculations that help inform your rate choices – if you want to get really stuck in. At the same time, the previous lending screen had a little ‘Mkt’ link, which opened a window showing you the real-time Queue to a high degree of detail, but unfortunately not in a format that’s very easy to play with. For the new screen, we’ve decided to take the best of both worlds and provide a downloadable spreadsheet providing up-to-date information on the current Queue of Offers in all markets. Additionally, we’ve anonymised the information (except for your username) for security reasons. All that aside, we believe the new screens are a lot cleaner and easier to navigate, and should make it less daunting for new Lenders and more insightful for experienced Lenders to play with their Lending Offer.